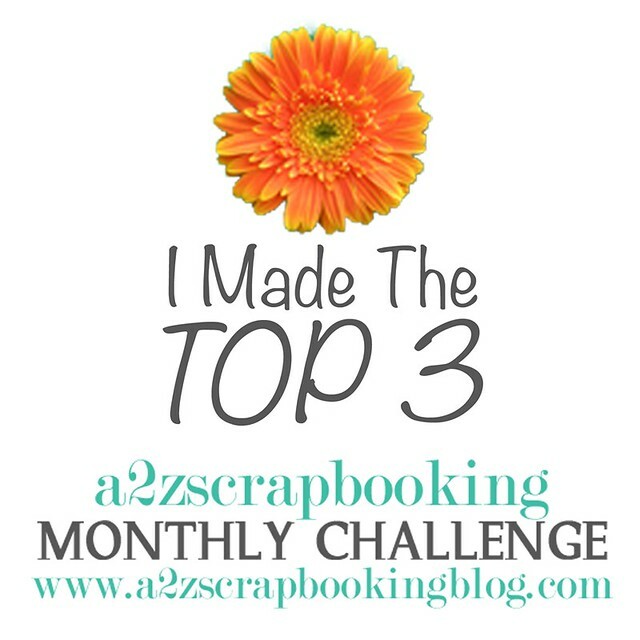 PE: A2Z Scrapbooking Challenge Top 3!! 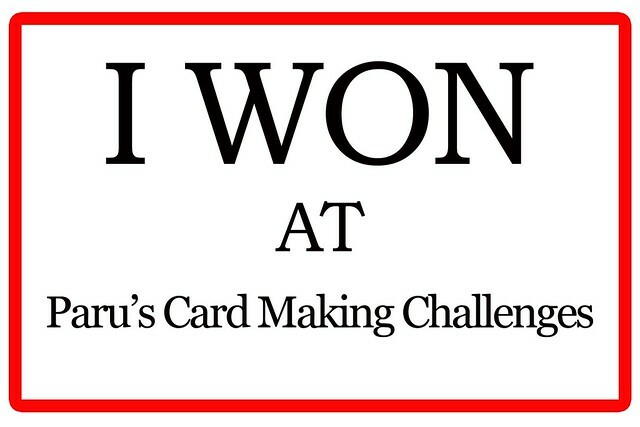 Winner at Paru’s Card Making challenge!!! Yay!! Hello! I am posting here a card, I sent to my dear blogging friend, Pooja – it was her birthday earlier this month.. and I didn’t send the card on time!!! I somehow messed up the dates in my mind, and ended up sending it later than I wanted, ending in the card reaching her after her birthday. 😦 Sorry about that, my friend!! I used the gorgeous flower dies, Peony Dreams from Altenew. I watercolored the die cuts, using Gansai Tambi watercolors for the base colors, then using Gansai Tambi Starry Nights for some shine. I then adhered the pieces together and left them to dry while I prepared the card base. I used Waffle Flower Layering Marble to create some beautiful marble patterns on the entire one side of the grey card base. Once done, I scored the paper, and adhered the die cut flowers and leaves, leaving enough space for the sentiment. 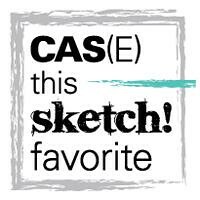 For the sentiment, I used Altenew Label Love, around which I drew an outline using a black pen. I trimmed this, and adhered it with several other pieces of cardstock, to achieve some dimension. For some sparkle and shine, I used Art Alchemy Opal Magic Vintage Silk on it. This, I adhered on the card base. I added a few dots of gold embossing on the centers of the larger flowers along with adding a border along the fishtail banner. I stamped all the images, from My Favorite Things Cat-itude stamp set, on scrap cardstock, fuzzy cut and colored them all using Zig Brush pens. The frame is die cut using Paper Smooches Scallop Frame die. I then adhered them using double sided tape and, the frame inset using glue. 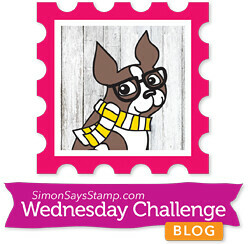 PE: Winner at Addicted to Stamps & More challenge!! 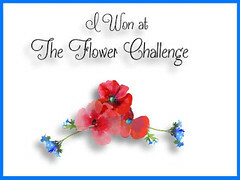 Winner at The Flower Challenge!! Yay! 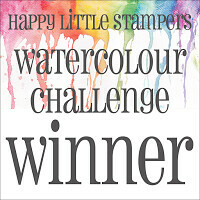 Happy Little Stampers Winner!!! Triple yay!! So, I started with stamping the flowers, first with distress ink, since I wanted a splotchy look, and then with Versamark Watermark ink and then heat embossed them clear. Same for leaves. I then watercolored them using Zig brush markers. Once dry, I added a few splatters using my Camel Drawing inks. The sentiments are from Avery Elle Laurels and Altenew Beautiful Day. I used the same stamp sets for my handmade envelope too. Hello! I have been trying a few favorite media, mixing and matching them. My source of inspiration is still the challenges going on for the Winnie and Walter 3rd Birthday Celebrations. I used pattern paper, then some handmade pattern paper using the stripes from Scenery: Stripes (I swiped the ink pads here, instead of dabbing the ink) and then acetate, on which I head embossed gold ep after stamping the gems from My Precious stamp set. Oh, I used Zig two way glue behind the gems for adhering the acetate – I applied it, let it dry and become tacky before adhering it. After adhering the pieces on the card base, I used the banner from The Big, the Bold and Extras, and sentiment stamps, fussy cut them, adhered them on the card. Hello! Continuing with Winnie and Walter 3rd Birthday Celebrations, I made a few more cards this weekend. I’ll post them one by one. The first one is shaker card, made using Winnie & Walter My Precious and Scenery: Stripes stamp sets. I used MISTI to stamp the gems on a card panel. The first time I am using MISTI for this purpose – I usually just eyeball and stamp.. and I have only used MISTI when I need to stamp the image twice.. or some special cases.. So anyway, easy to see how pretty it came out. Once done, I stamped the stripes and then the sentiment on another panel using MISTI too. I then adhered these together to make the shaker, finally adhering it to the card base. I first heat embossed the heart and flowers with gold embossing powder on vellum, which I then colored using Zig brush markers. I colored the flowers underneath the vellum last time, this time, I added it on the top – any case, you’ll have to wait for it to dry anyway! 😉 I then fussy cut them out. The sentiment, I cut from a cardstock, which I had painted with gold acrylic paint – it looks beautiful with the gold embossing – not too overpowering, but still shiny enough to stand out! 🙂 I am glad I used it too! Well, I also did stack it with a few layers before adding it to the card. Assembly was mostly easy, once I knew where to place what!